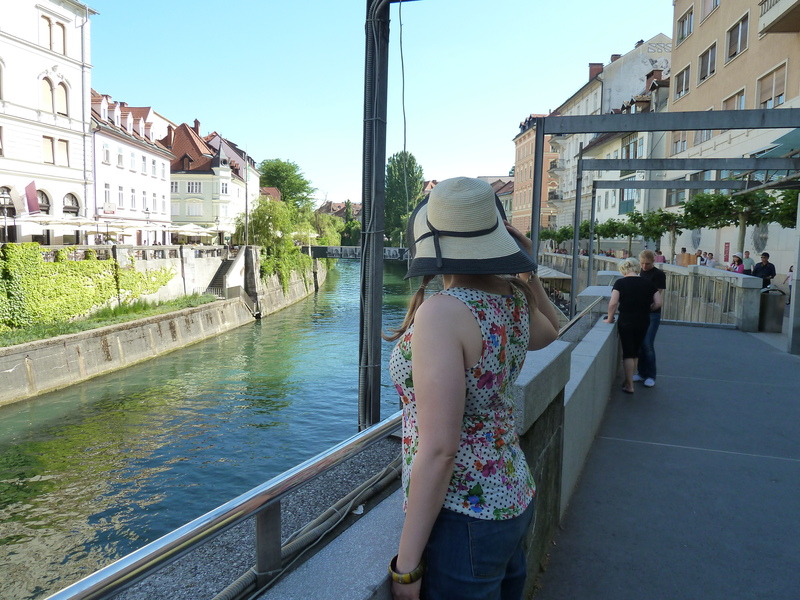 I didn’t have particularly high expectations of Ljubljana. I’d anticipated a forgettable ex-communist city containing dreary high-rises and a dearth of ancient cultural entities. What I got was a castle perched atop a near-vertical hill, genial cafe culture and an international break-dancing competition. As we chowed down on a couple of riverside burritos (they’ve enthusiastically embraced the Euro, so we baulked at the unexpectedly high prices of more authentic fare, and plumped for faux-Mexican instead), it was hard to avoid the loud hip-hop drifting across from the opposite bank. There turned out to be a large stage erected directly in front of the river, where we discovered a series of impressive dance-offs. Entrants varied in age and country of origin. With a mixed commentary in Slovenian and broken English, it was hard to understand exactly what the judges were looking for. Thankfully it was pretty obvious who’d gone through each time so we enthusiastically joined in booing and clapping, watching with horrified fascination as upside-down 12-year-old boys span effortlessly on their heads. The crowd was sparse (perhaps break-dance is still a fledgling activity in Slovenia) so we had prime position, and as the head-to-heads seemed to go on forever it was hard to tear ourselves away. In the end, feeling incredibly self-conscious in my floppy hat and flowery vest top – such attire embarrassingly out of place with these cool kids in their Vans and baggy t-shirts – we departed to take advantage of the scorchingly hot weather and plentiful ice-cream stands which lined the embankment. Slovenia is another country shamefully low on my “to visit” list. But for those of you with romantic aspirations, for whom Paris is a bit old hat but Venice not quite financially viable, stick Ljubljana on your shortlist. With the stone-lined narrow river, endless cafes, hill to the north with a cathedral castle (a flipping castle! ), it’s basically Paris in miniature. I mean, really miniature . . . containing a population of 270,000, and a central area you can walk across in less than 20 minutes. Along with their French counterparts, the Slovenians take their day of rest very seriously. FYI: if you’re planning to visit Ljubljana for 24 hours, try to avoid the majority of those falling on a Sunday. Luckily, the weather was glorious and the cafes were doing a roaring trade so we were able to stroll through the old town and continue our recent discovery of the fact that the Balkans love tiny dogs; and more than that, trimming their fur in the oddest of patterns. Sadly I don’t have any photographic evidence of these poor bald puppies but they stared forlornly from under many a cafe table, although whether at our ice-cream cones or luscious locks, it’s hard to say. I must admit that we saw Ljubljana in arguably the best possible light, but even in the grey drizzle that started on Monday morning, it was hard not to appreciate the imposing buildings, lush Tivoli Park and impressive cycle network. Plus, they have cheese vending machines. 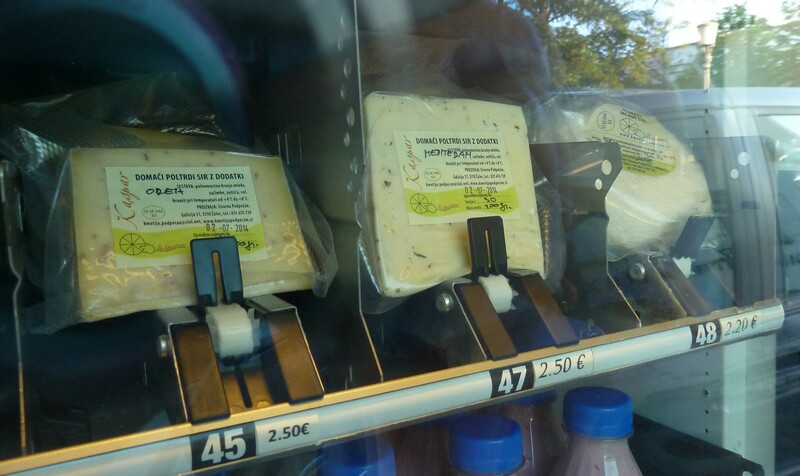 Vending machines that sell CHEESE. You’re like: oh, I fancy a bit of Gruyere – but disaster, it’s Sunday! No cheese for me. Hang on a second, HOLD THE PHONE, I’ll just pop on over the cheese vending machine and help myself to a wedge! Hangover winner, and the shopkeeper didn’t even need to get out of bed. Thankfully Monday’s rain held off just enough to allow us a brief foray into Tivoli Park, home of Ljubljana’s award-winning fast food restaurant, Hot Horse. This isn’t some trendy name: they literally sell hot, edible horses. In the form of a burger. Since Tesco had so kindly introduced us to this meat a year or so ago, it seemed daft not to give the pure, unadulterated version a try: and a good thing we did. They were gigantic, clearly very popular, and if not as flavoursome as beef, certainly more adventurous. I’m glad I tried it, although would I choose Hot Horse over Byron? Altogether now: NEIGH! I seriously recommend Ljubljana for a short break, not least because it’s such a tiny city that once you’ve wearied of strolling down the cafe-lined riverside, taking the Barclays-bike equivalents for a spin, or wandering off into the back alleyways to find a supplier of the local pumpkin oil (excellent on salads FYI), Slovenian villages in the mountain-fringed countryside are right on your doorstep. Like I say, Paris: but smaller. They’ve even got the cheese. And the horse. Enjoying my blog? Why not subscribe to it via RSS feed, follow me on WordPress, or leave a comment below. You’ll make my day (and I’m stuck in Charles de Gaulle airport so would appreciate the love right now).